The Arctic blast of cold air is here. Temperature readings are in the 20s for most of the area right now, but the wind chill is cruelly making it feel as if it’s in the single digits or, if you’re lucky, the teens. And, it is seriously windy out. A wind advisory is in effect for New York City and surrounding counties until 6 p.m. Thursday, which will then be replaced by a high-wind warning lasting until 6 a.m. Friday morning. The National Weather Service warns of winds between 20 and 30 miles per hour, with gusts between 50 and 60 miles per hour Thursday night. Thursday’s below-freezing temperatures also came with a few snow squalls, and the city can expect some flurries and flakes throughout the day, and maybe a few more scattered snow showers overnight. But there’s a chance for more than gutter snow and some decent accumulation around New York starting Friday night into Saturday morning — a whole 1 to 2 inches. Any dream of the city turning into a winter wonderland will be crushed swiftly, though, because that snow will change over to rain. Indeed, the polar vortex is heading back north this weekend, to be replaced by a warm air mass from the south. 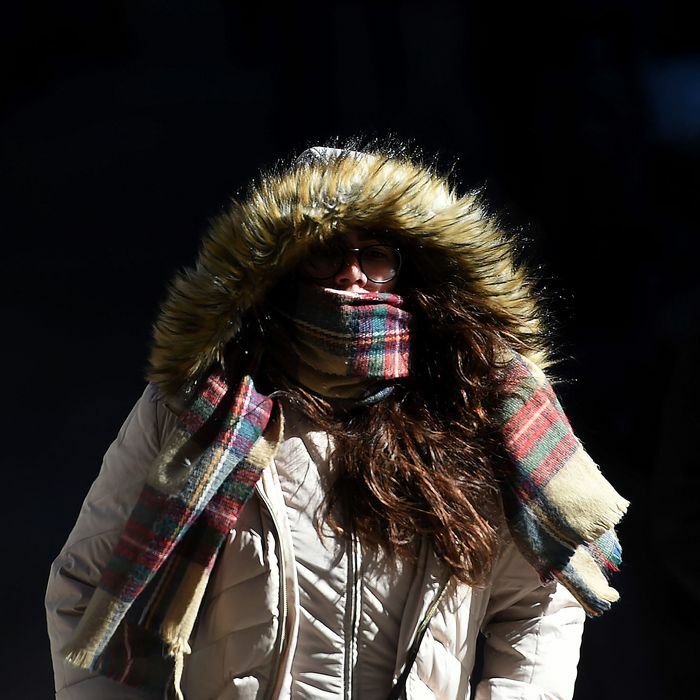 The temperature on Saturday will be about normal for this time of year, highs in the low 40s, and on Sunday, it’s going to feel positively balmy, with highs in the low-to-mid-50s — a nearly 30-degree jump compared to Friday. And no, you probably will not be able to enjoy the jolt of fall-like weather, because, of course, it’s going to keep raining.